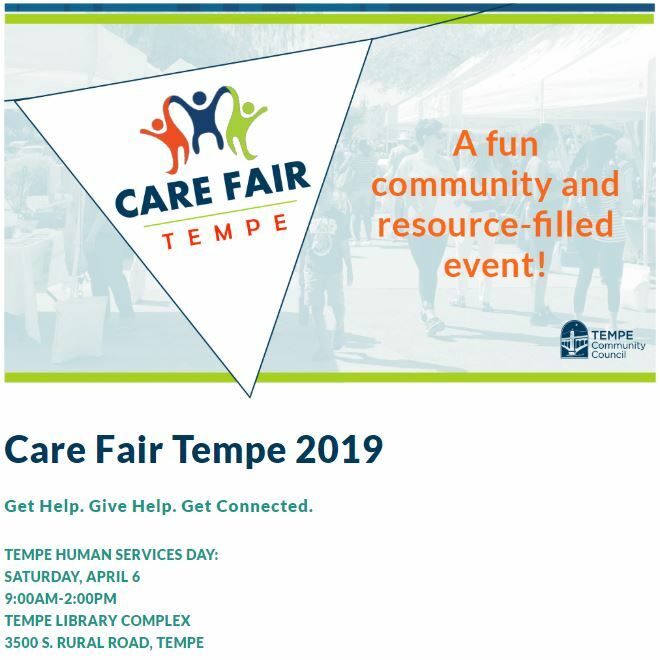 Join us for our second Care Fair Tempe as we host a fun and resource-filled event linking those in need with available services and those who care with volunteer opportunities. Over 50 local nonprofits and service providers will be on-site to provide information and answer questions about a variety of human services they offer and how you can help through volunteering and in-kind donations. Bring the family to visit resource booths, experience on-site services, play in the kid fun zone, grab a snack from food vendors, listen to music and enter into our gift card giveaways. This year we are partnering with the City of Tempe to present the inaugural Tempe Human Services Day. While visiting Care Fair Tempe, plan to attend the Tempe Human Services Symposium in the Community Room of the Tempe History Museum. There will be a line-up of specialists providing information in the fields of mental health and related topics such as substance dependence.